Sports and energy drinks — two different types of popular beverages. But though different they have one thing in common: they can both wreak havoc on your tooth enamel. That's because each contains high concentrations of acid. And acid is tooth enamel's mortal enemy — prolonged exposure with it causes the minerals in enamel to soften and erode, a process called de-mineralization. Demineralization becomes even more pronounced when the mouth's pH levels fall below 4.0 into the acidic range. A sampling of various brands of sports and energy drinks reveal mean pH levels below even that threshold. 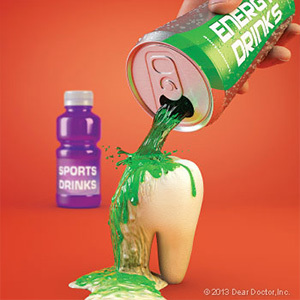 Energy drinks are especially harmful to enamel because the type of acid they contain is more concentrated. So, what can you do to minimize this threat to your dental health? The optimal thing to do is avoid such beverages altogether, especially energy drinks. If you currently re-hydrate after hard work or exercise with sports drinks, consider switching to water, nature's hydrator. Wait until mealtimes. Saliva is your body's way of neutralizing acid in your mouth, but it takes about 30 to 60 minutes for it to fully buffer acid. If you're sipping between meals on acidic beverages, saliva can't keep up. So, wait until you eat or limit your sipping time on a drink. Rinse with water. Since water's pH is neutral, swishing some in your mouth right after drinking a sports or energy drink will help reduce acidity. Wait an hour to brush. Your enamel will begin demineralizing as soon as it encounters acid. If you brush right away you could be sloughing off miniscule amounts of softened minerals. By waiting an hour you give your saliva time to buffer and help re-mineralize the enamel. Although popular, especially among teenagers and young adults, overindulgence in sports and energy drinks could damage your teeth and increase your risk for tooth decay. With a little moderation and common sense, you can keep your enamel strong and healthy.